With the changes to the breakfast room wall, you can see that post here, I just had to put together a coordinating tablescape. I borrowed a few things off the kitchen counters. I just thought the colors worked well with the placesettings. The yellow and orange looks so good with the colors in the room. The flatware is from Horchow on sale and the white plates are from Big Lots. Everything else are Goodwill finds. Isn't it fun to find such treasures. I love these salad plates. Green, yellow and orange, all my favorite colors. 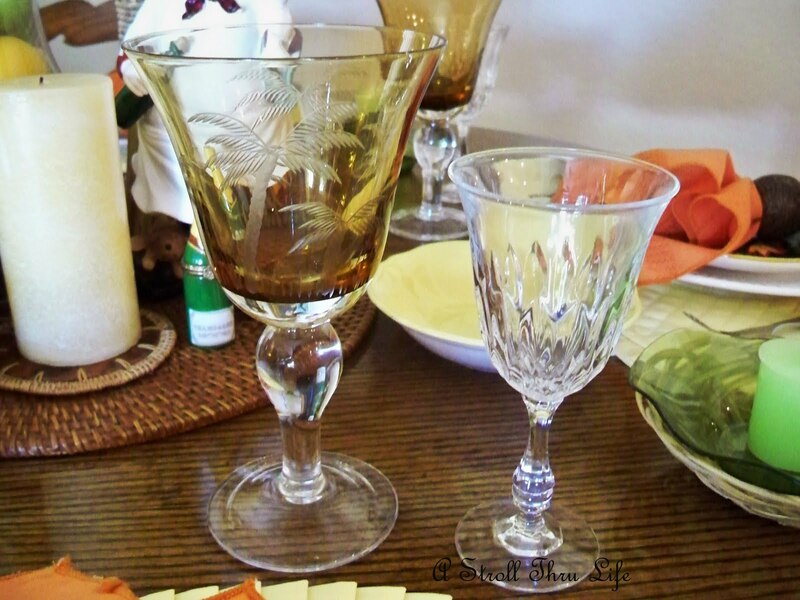 The amber goblets came from Pier One years ago, and the small wines are also from GW. The sun is going down so I decided to light the candles. Love the little chef's face with the glow of the light. 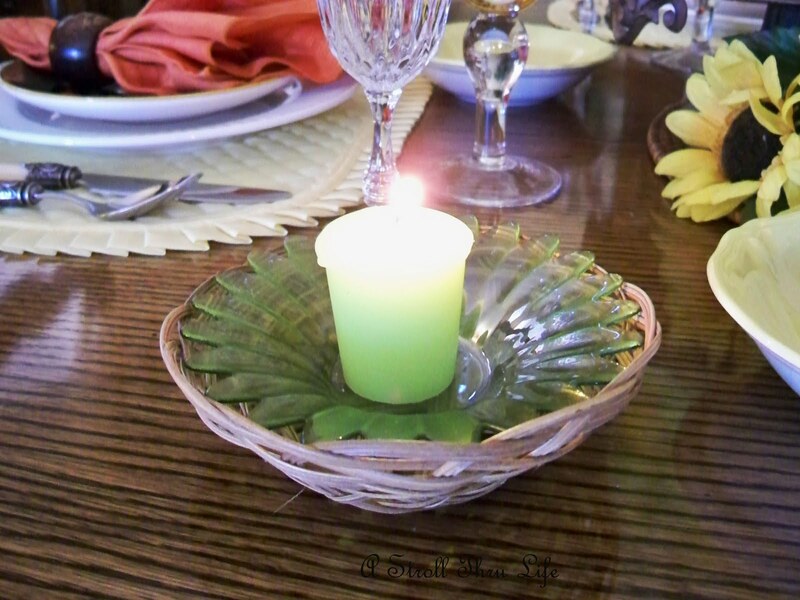 The little baskets, votive holders and candles all came from the Dollar Tree. Love the look against the breakfast room wall vignette. Coordinates beautifully. LOVE this table! Those salad plates were a terrific find at GW! Oh Marty, you did bring in the warmth of the Tuscan countryside to your table, so charming and so very inviting. Everything I see is just something that I would want, what great finds. Love your table ware and those salad plates, think I'd like to find some just like them! Oh Marty! Every time I come over to your blog I am amazed by your creativity and the thought that you put into everything you do. Thanks so much for inspiring me once again! It's so cheerful and "fall-ish", Marty! Everything is so beautiful!! I especially love the picture on the wall of the man in prayer!! This is just a wonderful end of summer table Marty! The colors are so pretty and it looks great with the changes you made to the room-enjoy! Marty~I'm always looking forward to what you do next! You have such great ideas and creativity! I love it all! I love seeing your beautiful nook again...perfection! Another lovely job, Marty! I wonder how you keep coming up with imaginative tablescapes! The dishes look great together and I am loving the cute centerpiece. At first I thought the cloche has lemons and limes in it! lol! I love the variety of sources represented on your table, Marty! No one would ever know which was from the dollar store, Big Lots or Horchow unless they were told. I think that's one of the great things about decorating. You can bring in items from so many different price points and mix them together for a very cohesive look. I love the old world feel to this Marty! Great color combo, and the chef is very charming! I would love to eat at this table! What a beautiful share this evening. I love the mixture of the summer colors, the yellow, green and orange work so well together. I am so surprised. 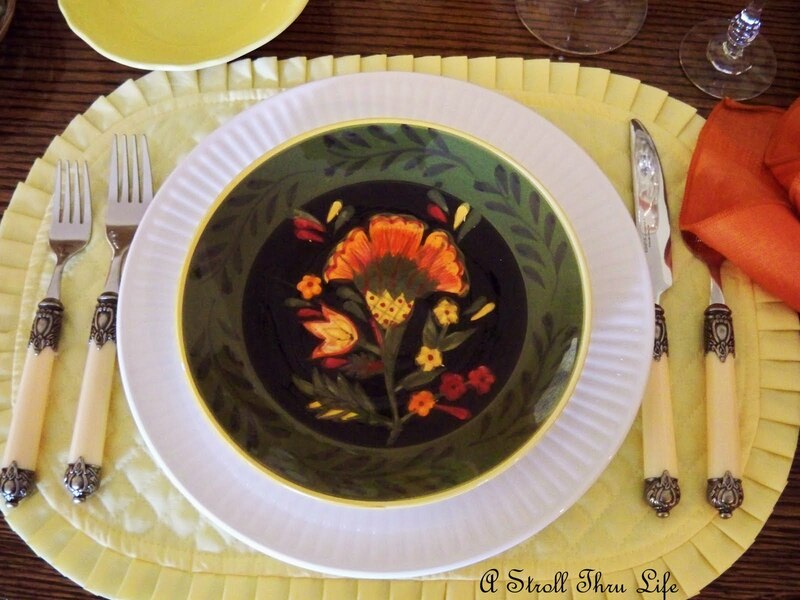 Love the plates and the pattern is gorgeous. Your two glasses looks so awesome together. Quite exquisite. I really enjoyed the photo of the light going down and the candle glow on the little chef's face. It is just precious. Thank you so much for sharing with me today. I have so enjoyed my visit. So pretty, Marty. It looks perfect with your new wall vignette. Marti, it's just lovely! I do love that wall! Wonderful table Marty! Everything looks so good together and accents your wll so well. thanks for sharing and inspiring again! I loved the wall makeover, and I think the tablescape goes with it perfectly. My favorite part is the small salad plates on top. They are so pretty! Of course, I LOVE LOVE your lemon lime cloche. I really want one like that. It's all so beautiful. 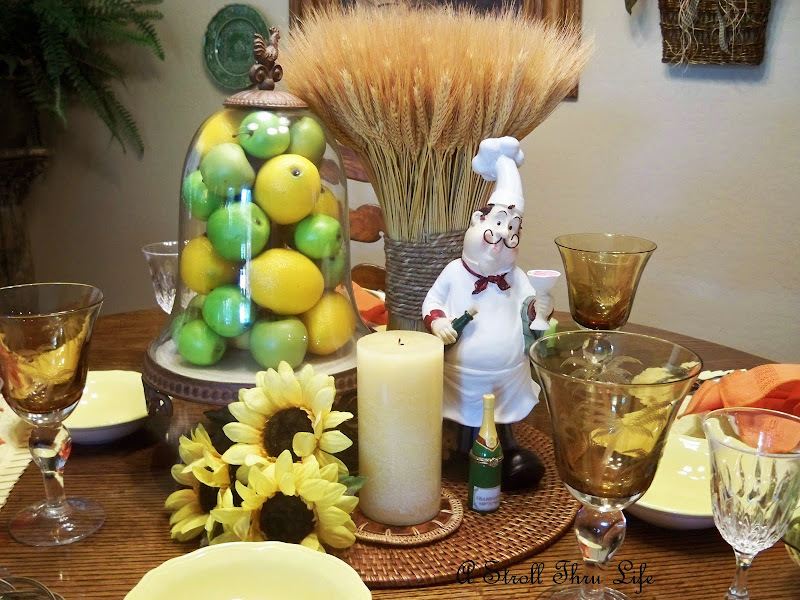 I just love the colors and the cloche with the lemons and limes is just over the top pretty. Love the table Marty! the colors are so warm and cozy. Makes you want to pull up a chair for a wonderful meal and conversation! What beautiful salad plates! Love your colors and detail. That picture always reminds me of my grandfather -- I've always loved it. What a beautiful table Marty!!! It looks lovely, Marty...a hint of Fall! I know you have had it with the heat! I am not ready for summer to end though. School doesn't start till after Labor Day here. Oh, I have a copy of that picture on your wall too--it is in my kitchen--it gets moved around. The thing I like best on your table is that little Italian cook--soooo cute! Yes, this is so beautifully coordinated! I love the greens, yellows and orange! I continue to be amazed at how you are pulling the pretty orange into your decor! Great job! Marty, your colors come together so beautifully. I love the pop of orange and it does all coordinate with your new wall scape so well. It's very inviting. Lovely table and what a terrific find with those darling salad plates. Did you make the stand of wheat? I want to use something like this on my fall mantel. Really beautiful! I love the little chef. That little chef looks just right in that setting.. Pretty, as always.. The colors are spot on. It looks so warm and fall like. Thanks for sharing,enjoyed my visit. 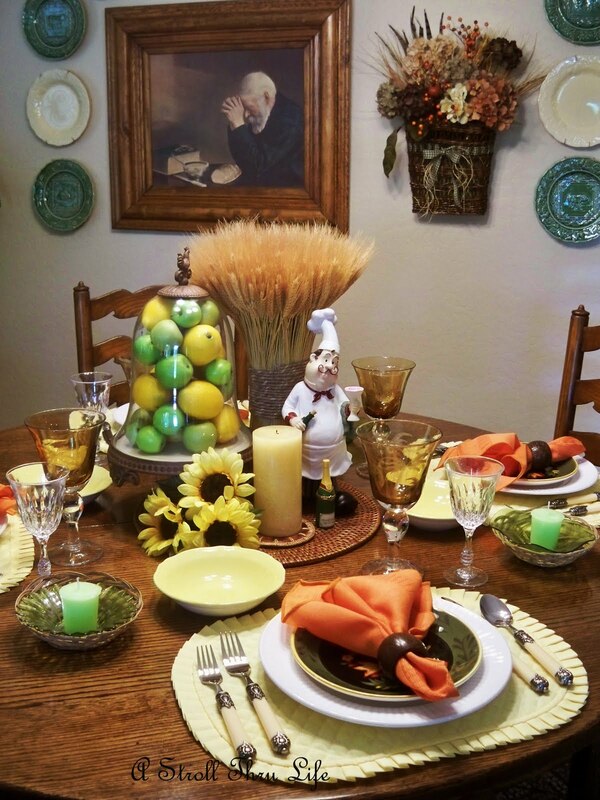 Marty you did a great job capturing the Tuscan feel on this table with your color choices. I love those salad plates and amber goblets! I like how you added the wheat and lemon limes in your centerpiece on your wicker placemat. Very cute idea of the votive candles in the small baskest too! I just love all of it! How nice of you to let me see your lovely eating area again! It inspires me! Honestly, you have such a decorating knack! The mix of colors and dishes, especially the green salad plates, make my heart sing! You know how I love to stack mismatched dishes!!! The beautiful flatware lends itself to this old world table so well! Beautiful and warm table! As usual,I leave you smiling! 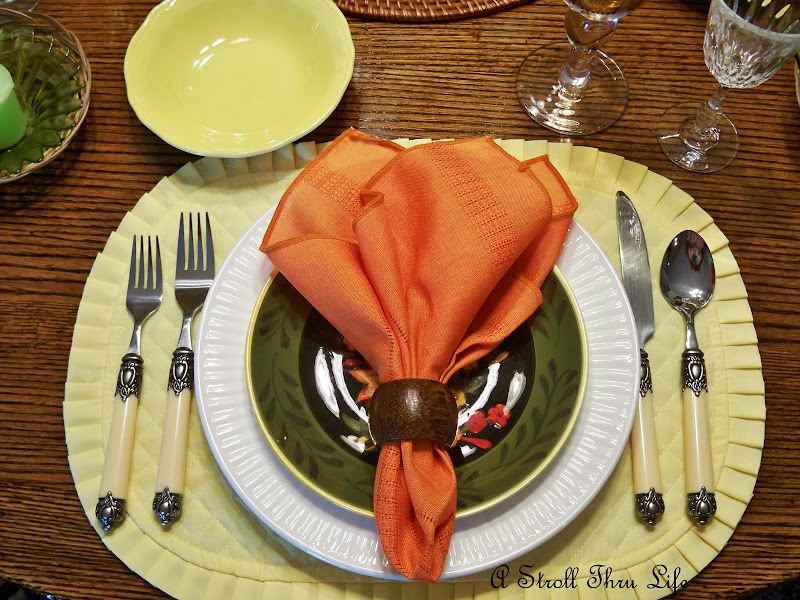 Oh, Marty, the wonderful colors and textures in your tablescape give me hope that Fall is coming! We are ready for cooler weather, for sure. Your attention to detail is evident in this table, and I love the touch of whimsy your chef adds! It looks great...I love how the apples give it a pop of color. 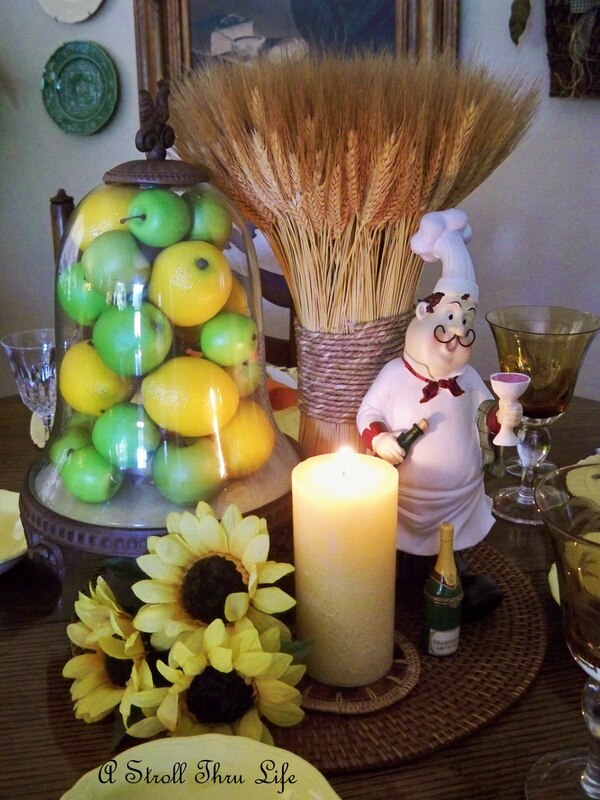 Marty, I love this centerpiece idea.....the lemons, limes, the little chubby chef, the wheat. Great use of texture and color!! So creative as always! Marty, you drew me in like a magnet with your color scheme. It isn't fall yet, but the yellows and some orange is getting me there and I'm dreaming about my favorite time of year and cooler temps. Have a great day, you creative woman of God! Love the colors...the salad plate is stunning. You do such an amazing job mixing textures and colors to evoke exactly what you want. I'm always impressed. Looks lovely Marty. Has me SO excited for Fall! Love the colors of this tablescape...it's just charming! The new wall decor coordinates very well with this warm and charming table setting! 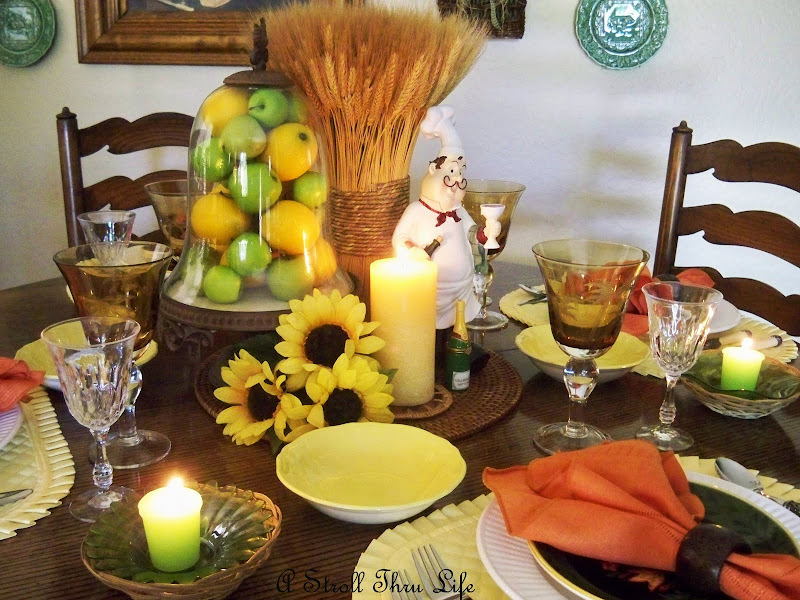 I love the "feel" of your tablescape! 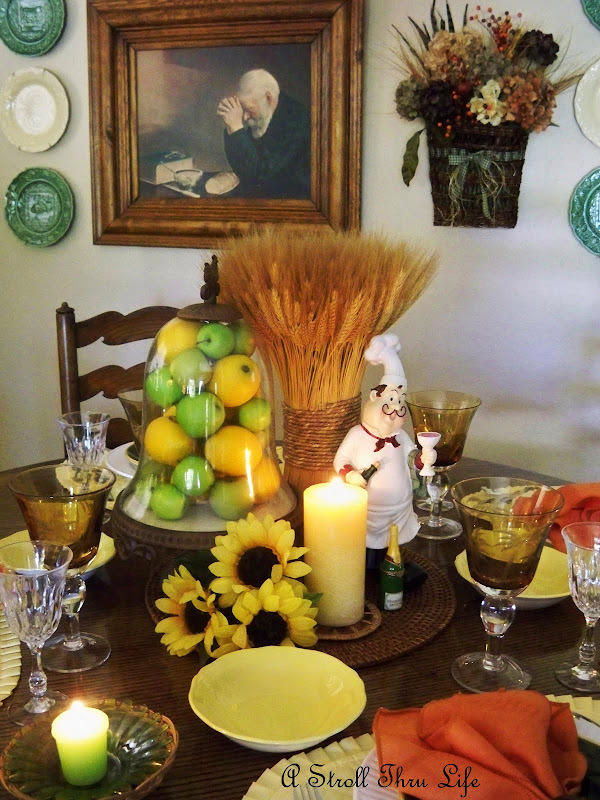 Love the wheat and the cloche with the apples and lemons - it all works together so beautifuly! You are right, the colors are perfect with your new look. That flatware is gorgeous...I really love it. Your new wall-scape looks terrific and I especially love the "Grace" picture, it exudes so much meaning. The salad plates are lovely and I like how you group your various items into a centerpiece by using the round placemat. Love your "baker" and especially your flatware - very unique! 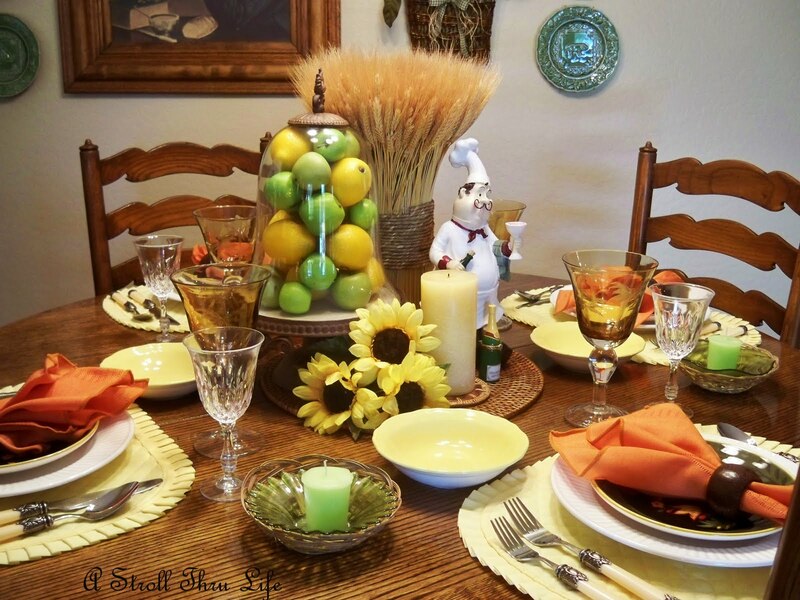 Love the colors in your tablescape. It's got me looking forward to Autumn. You are so great at taking items from one room to another to create beautiful tablescapes and vignettes, like the items you borrowed from your kitchen to create your fabulous tablescape.